Classically, postsynaptic NMDA receptors act via calcium to signal coincidence detection in Hebbian learning. However, growing evidence shows that NMDARs can signal metabotropically, without fluxing calcium. Moreover, NMDARs have been found presynaptically, where they cannot readily function as Hebbian coincidence detectors. Because NMDARs are key components of central functioning in the brain such as learning and memory, they are also hotspots for synaptic diseases such as Alzheimer’s disease, epilepsy, and schizophrenia. The complete elucidation of the many different modes of NMDAR signaling is therefore of utmost importance. 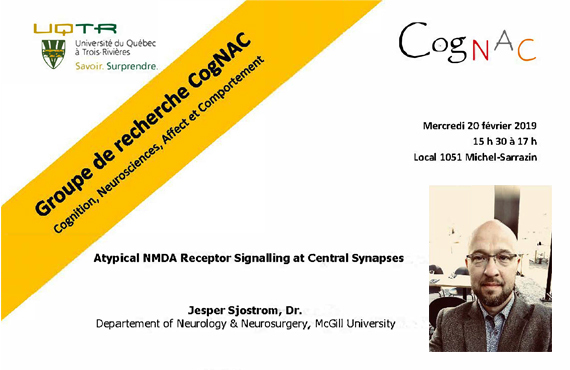 I will present work showing a double dissociation of presynaptic NMDAR signalling in regulating neocortical neurotransmitter release. In pyramidal cells of neocortical layer 5, presynaptically located NMDARs signal in a non-overlapping manner via RIM1 or JNK2 to control evoked or spontaneous glutamate release, respectively. Furthermore, the regulation of evoked and spontaneous release were differentially sensitive to magnesium blockade, suggesting metabotropic NMDAR signalling. Findings such as these challenge the textbook view of the NMDAR and improves our understanding of its roles in physiology and disease. Tous les étudiants sont encouragés à venir se joindre à la discussion!